Choosing the right location to organize international exhibitions and events is critical to reach your targeted audience. For open events choosing a particular location will generally induce an undesired local bias, which you can compensate by proactively trying to attract the right mix of international participants. To do that, onomastics (name recognition) can be a useful communication tool to leverage the right channels. It is also a great data mining tool to analyse, after the event, the international mix of participants. Company nationality, nationality or residence of a participant, are often misleading information. 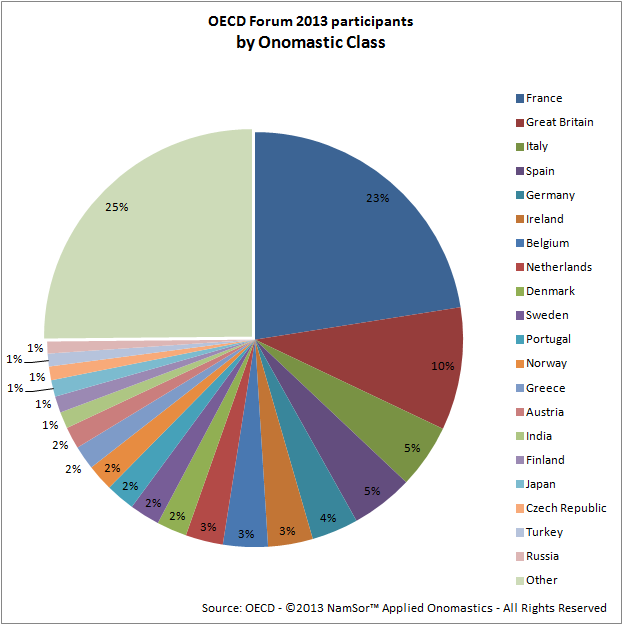 For example, let us look at the participants list of the OECD Forum 2013, which took place on 28-29 May at the OECD headquarters in Paris and attracted about 1500 visitors. Firstly, attributing a nationality to companies is becoming increasingly difficult. ‘The Parliamentary Network on the World Bank & IMF‘ is clearly international. ‘NetworkIrlande‘ is based in Paris but with a clear Irish touch. What about ‘Ernst & Young‘? It could be classified as international, if you attracted a partner in charge of a global business unit. But it could also be classified as local if you attracted a local consultant hoping to network with his clients in Paris. Secondly, considering only the Country of Residence leads to overestimating the local bias. 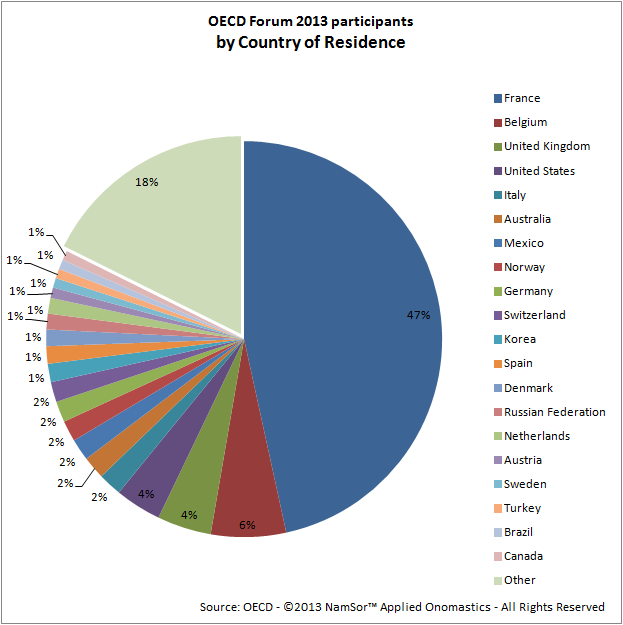 Give the chart below a casual glance and you will get the impression that the OECD, being in Paris, struggles to attract visitors from outside of France. That’s not a fair view of reality. For example, the French residents include a large number of international diplomats based in France as well as international researchers at the OECD itself. Thirdly, looking at people’s names provides additional information though it remains imperfect. It partially corrects the local bias. In the chart below, the OECD Forum looks indeed more international. Our method of anthroponomical classification can be summarized as follow: if a OECD participant were to become an Olympic athlete (after a bit of training of course), judging from his name only and the publicly available list of all ~150k Olympic athletes since 1896, for which team would he most likely run? This information is also imperfect. In this chart ‘France‘ means French, as in French name. Many names from, say, Québec, Luxembourg, Belgium, etc. will be misclassified. The United-States do not appear in the chart but ‘Great Britain‘ and ‘Ireland‘ will include names from North-America. Combining both information (residency and onomastics) we can drill-down into the demographics of a French residents and further reduce our false impression of a disproportionate local bias. We finally get a more realistic picture of the proportion of local visitors (though it may still include a few people from Belgium, Luxembourg, Québec, etc.). Now, how can we measure the local bias? 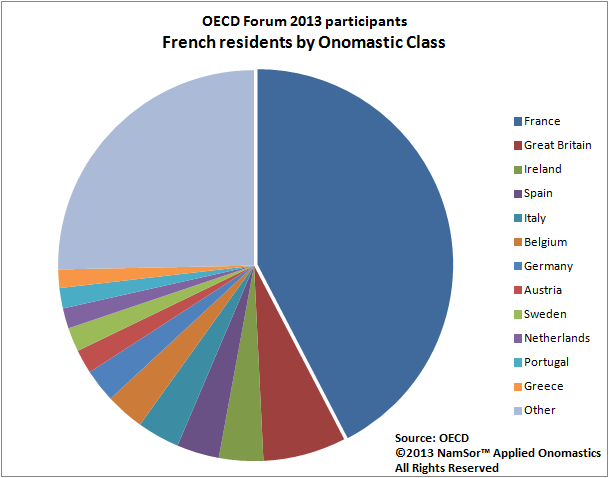 The question is : how many Frenchmen would normally be present at the OECD Forum, should it take place in a neighbouring country – and to do that we could use other international events as a benchmark. Our conclusion : there is a bias, but it is reasonably small. 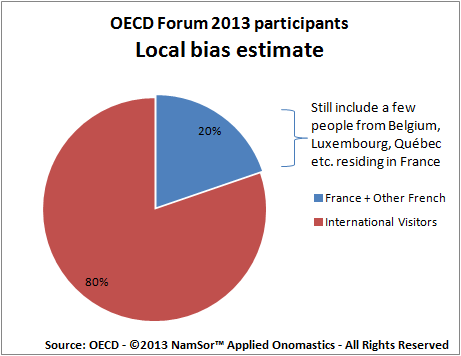 Good news, the OECD Forum is a truly international event: no need to move it to London, Geneva or Berlin !